Find out why 90% of pros use SCUF. Take your game to the next level with the fully modular SCUF Infinity1. Change thumbstick length & shape, fully adjust triggers and remap paddle configurations on the fly. Every SCUF controller is handcrafted & customized to specification. Customized by you. Handcrafted by us. Use 100% more of your hand for advanced gameplay.
" When I’m in a gunfight I don’t have to take my thumb off the aimer (thumbstick) at any time, it’s going to help me win more gunfights and get better positioning on the other team." Like tires on a car, thumbsticks wear down! Swap out thumbsticks in seconds with the SCUF patented Infinity Ring and Lock system. Switch from regular to tall length, from domed to concave depending on preference and gameplay style. The Infinity Rings provide easy open & lock system to swap thumbsticks while also increasing smoothness during the rotational movement of the thumbsticks. 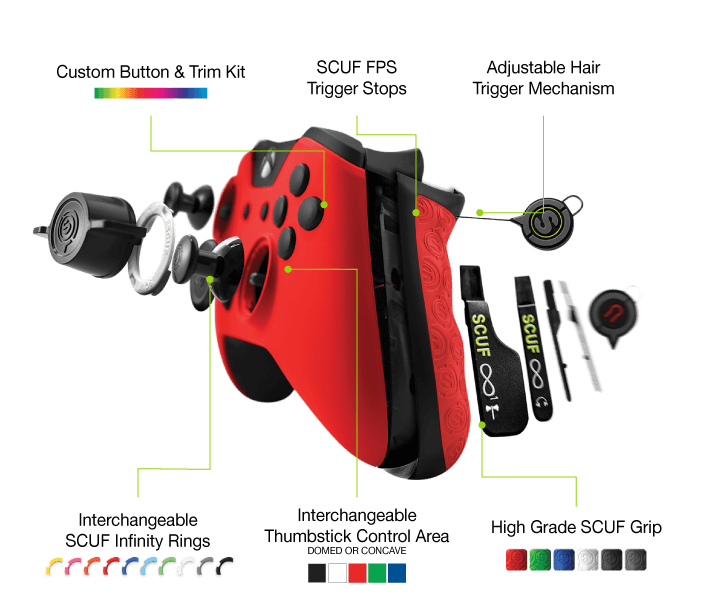 The patented Infinity ring and lock system comes standard on every Infinity1 controller. Available in 10 colors and available for purchase separately. * The Infinity Lock is included with every SCUF Infinity1controller. - Rounded and precise, the domed shape is tailored for accuracy. A perfect fit for the right thumbstick. - Allowing the thumb to dig in, the concave shape is built to improve your movements, traditionally controlled with the left thumbstick. - Replicating the standard size of Xbox thumbsticks, the regular size provides reactivity that is especially needed for movements. - Taller thumbsticks mathematically provide more angle to play with. Outside the increased precision, it will also fit larger hand size. The SCUF FPS Grips are the best of two worlds : SCUF’s patented adjustable hair trigger and trigger stop mechanism embedded with the SCUF Pro Grip handles feature. Adjustable hair triggers are externally adjusted with the SCUF Key to allow the user to tune the tension and position of the trigger. The FPS Grips also feature a trigger stop so that trigger movement is reduced. The trigger returns to the initial position and is ready to use it again faster. * While this trigger system is great for shooter games, it might become inconvenient on other games like racing games. Therefore, the FPS Grips can be swapped in seconds with the default Xbox One controllers handles provided by SCUF in your SCUF Infinity1 controller box. 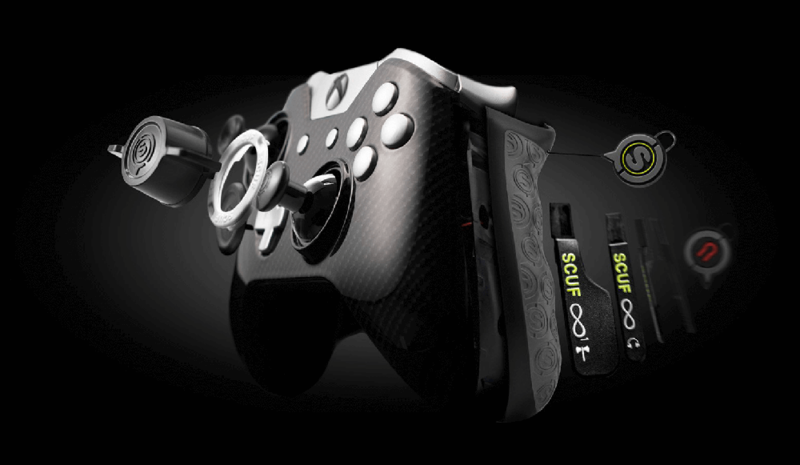 In order to improve your grip handles, SCUF offers two grip options which can also be combined. - SCUF Pro Grip handles, are made of a high grade rubber material and on the handles of the controller. Contoured to fit your hands and embossed with the SCUF logo for extra grip, available in multiple colors. - SCUF Grip is a textured military-grade grip that can be paired with SCUF Pro Grip handles or may cover the entire back of the controller to ensure grip control even at the highest level of game play. * SCUF Pro Grip handles can fit any Xbox One controller (earlier than Xbox One S controller version) and the removal tool to install them is included in the SCUF Infinity1 controller box. The SCUF control disc transforms the D-Pad to a control system similar to a thumbstick. Improve the comfort of D-Pad use, with easier to activate diagonals. The control disc is especially effective in fighting games where combos are essential. The SCUF Infinity Series are the most customizable SCUF controllers ever created. From functions to design, the possibilities are endless. SCUF uses innovative techniques to provide high-end shell designs for professional gaming controllers. The soft touch finish available on many SCUF controllers provides extra grip to the controller, while the glossy finishes will. Shells, grips, triggers, thumbsticks, rings, buttons and trims are available in a wide range of colors. With so many features and design options available, every SCUF controller built to specificatoin at SCUF workshops based in UK and USA. To provide the high-quality that every gamer deserves, each controller is also hand-crafted following a strict process that will make it a unique piece of hardware. Finally, in order to ensure optimal performance, a complete quality check and in-game hand-tested is performed on every SCUF before it ships! SCUF controllers are designed to increase hand use and reduce unnecessary latency with ergonomics, comfort and safety in mind. Reducing excessive and uncomfortable hand movement with the patented paddle control system and trigger control mechanism. SCUF controllers help gamers reach their true potential and decrease the chance of hand injuries caused by techniques like CLAW. Each SCUF controller is fitted with a unique, tamperproof SCUF seal of approval. This guarantees the controller was built by a certified SCUF technician. Ensuring the controller is legal to use at major tournaments including Call of Duty World League, MLG, Gfinity, ESL, SFCO, EGL and more.